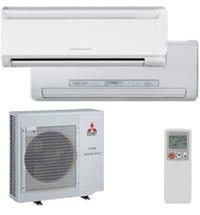 Bishop Plumbing, Heating & Air Conditioning offers Mitsubishi air conditioners, with options for single-rooms, multiple-room, indoor units, and outdoor units and evaporative coolers by Breezair. The Mitsubishi M-Series wall-mounted and ductless systems keep your residential and light commercial properties cool in the summer and warm in the winter. It’s the perfect way to cool or heat any single room or multiple rooms in your home or office to attain personal comfort. With user-friendly controls and the ability to create zones within the space this is truly a personalized comfort solution with perfect year-round comfort. The Mitsubishi Electric indoor units are easy to install practically anywhere, high on a wall, to blend into a room without taking up window space, or on ducted systems, in a ceiling or below the floor and totally out of sight. An optional heat pump system automatically switches the system between cooling and heating to compensate for fluctuating temperatures. Mitsubishi ductless systems have long been the choice of thousands of homes, churches, schools and libraries across the U.S., and especially in homes in Aspen and Vail, because they’re nearly silent. Mitsubishi Electric systems use cutting-edge technology designed to increase energy efficiency and eco-friendliness while providing innovative comfort control. The systems features washable long-life anti-allergen filters with R410A, an environmentally friendly refrigerant, most of which is recycleable. With zones the system cools and heats only those spaces in use with advanced self-monitoring controls. The innovative compressor technology detects subtle changes in temperature and, like a car’s cruise control, automatically adjusts compressor speed – unlike conventional units, which start and stop repetitively. The MSZ-FE high-efficiency systems are ENERGY STAR rated and Tax Credit qualified, and provides 26 SEER in exceptional heating performance, providing year-round comfort in extreme climates, like those in Aspen, Vail, Glenwood Springs, and surrounding areas, while being extremely energy-efficient. We also offer the MXZ multi-room system, which is an excellent choice for supplementing capacity to your current system or to heat and cool newly finished spaces or new additions. With a multi-room system, you can enjoy your ideal level of comfort in the most important rooms in your home. Each room (zone) operates independently. People in different rooms – the kitchen, master bedroom or living room – can enjoy temperature settings that make each of them most comfortable. If you’re looking for a complete comfort solution for several different rooms, the MXZ multi-room system is the right choice. The system is flexible enough to conform to your particular cooling and heating needs, with over 40 different indoor unit combinations, up to four indoor units connected to one outdoor unit. And now, with a SEZ horizontal ducted unit, you can enjoy an even greater range of zoning options provided by an MXZ system. The new dual-zone MXZ-2B20 system with two MSZ-GE09 wall-mounted indoor units also qualifies for both ENERGY STAR and the Federal Tax Credit. Each wall-mounted indoor unit in the MXZ multi-room system mounts high on a wall and connects to an outdoor unit by a refrigerant line run via a 3” hole. In addition to the benefits of the MXZ, the MSZ unit also provide highly efficient solutions to cooling and heating needs, and provide personalized comfort for the individual zones in which they are installed. All MSZ and MXZ systems include a sleek, flat panel design, hot-start technology, quiet operation, enhanced filtration, wireless remote technology. The SEZ ducted units can provide similar split air-conditioning system advantages, with the added benefit of being concealed to provide virtually no visual footprint within the conditioned space other than a register and grille for the air to flow. With the use of short run ductwork, these units can provide comfort to a single room that needs air dispersed evenly throughout the space, unusually shaped rooms and even adjacent rooms. Features of the SEZ option on MXZ systems include concealed design for short run ductwork, quiet operation, a built-in condensate lift mechanism, and a wire remote control. Bishop Plumbing, Heating & Air Conditioning also offers the EXV Variable Speed Series evaporative cooler from Breezair. Evaporative coolers works when warm air is drawn into the unit through water saturated pads which cool the air and filter out dust, pollen, and other contaminants. The result is cool, clean, chemical-free, 100% fresh air that is great for you, your family – and the environment. While air conditioners can use CFCs, Freon or other chemicals to artificially cool the air, all the Breezair EXV uses is water! So it costs up to 80% less to operate than a conventional air conditioner. 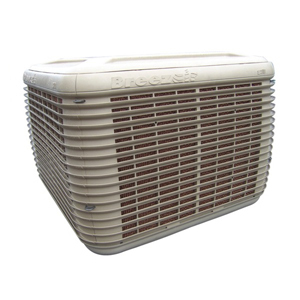 The Breezair EXV circulates fresh air from outside, where air conditioners may recirculate air which makes it healthier and better for sensitive noses, eyes and skin. The Breezair EXV Variable Speed Series cooler is perfect for large space cooling and small space cooling. Breezair units are energy efficient, clean and healthy, easy and inexpensive to install, environmentally friendly, and simple to maintain. The system monitors water quality by sensing total dissolved solids in cooler sump pump and the system can automatically drain the water to prevent algae growth when the cooler is not in use. Before impurities build-up inside the cooler, they are automatically detected and replaced with clean water. By doing so, cooling efficiency and pad reliability are increased, resulting in decreased maintenance over time. When looking to keep your Aspen area home cool during the summer, or your Vail commercial property warm in winter, look no further than Bishop Plumbing, Heating & Air Conditioning. Give us a call today so we can help you find the right system for your needs!